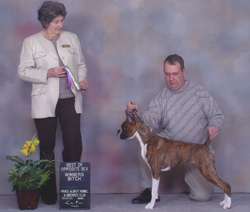 Secret posing with breeder owner handler Dave Gilmour and judge Thora Brown. Health: Eyes CERF normal, thyroid normal, hips OFA good, and heart: SAS clear (no murmurs) and two 24-hour holter monitor tests (Jan 2007 = 1 VPC / Jan 2008 = 4 VPCs). 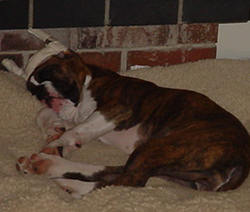 Degenerative Myelopathy (DM) at risk. Arrhythmogenic Right Ventricular Cardiomyopathy (ARVC) = heterozygous. About Secret . . .
Secret is a very good girl and she's so very easy to live with – she's sensitive and loving, mischievous and coy, and playful to the point of being almost annoying. Secret is totally toy crazy and can jump to catch any toy, at any time, in any position imaginable. She's quick, she's fast, and she has the moves that – not only keeps toys away from her mother, Sawyer, but – would make any athlete envious. Her home is her castle and her family and friends are tried and true, just ask Dennis Avery who makes her dance and prance and jump and talk all at the same time whenever she sees and / or hears him (Dennis lives with Secret's brother, Angus). 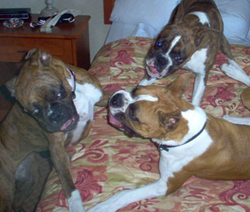 Secret is a littermate to Summer, Angus, and Payton: Summer and Angus are Canadian champions, Angus also has an obedience title, and Payton has numerous agility titles. 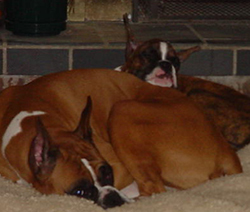 Secret had her first litter in mid-August 2008. She has been fully health tested and so is the sire of her upcoming litter: Canadian Champion Shadowdale Like a Rock CD CDI CGN SOM (also known as Chevy). We are very excited about these puppies, as this breeding has been planned more or less from the moment that Secret herself was born! 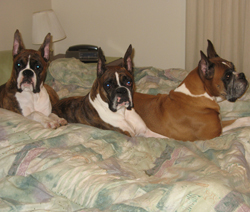 Of this litter, three puppies became Canadian champions in 2009 (including a multi BPISS winner), one more became a Canadian champion in 2010 and one more littermate is pointed! 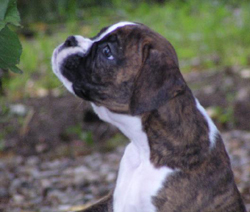 Secret became a Dam of Merit from one litter, and she is our very first hombred boxer to achieve this! 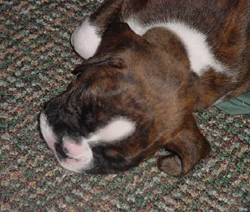 Secret's second litter was born on 29 March 2010. 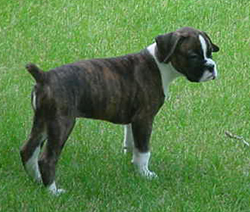 This is her final litter -- it is a linebreeding and it is ABC Futurity nominated for 2011. It is our very first Zaracon to Zaracon breeding! 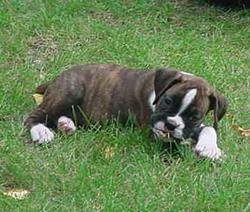 In September 2011, Bronx became the first champion in this litter; he is Canadian Champion Zaracon's Easy Street. 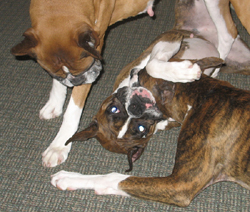 In October 2011 (Thanksgiving weekend), Lexi became the second champion in this litter; she is Canadian Champion Zaracon's Raised on the Street. Secret’s show career . . .
Secret was 5 months old when she had her first introduction to the show ring – it was a fun match where she won breed and a group second in the working group with Dave showing her. From that point on, Secret and Dave have been working together as a team to gain experience and build confidence. They have participated at shows in Alberta, Saskatchewan, Manitoba, and Ontario, and have done some nice winning. Secret is the 4th champion for her dam . . . thus making Sawyer a Dam of Merit. 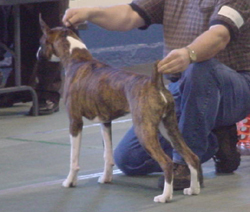 On 04 March 2005 at the Prince Albert Dog Show, Secret entered her first dog show and from the 6 to 9 junior puppy class, won winners female and best of opposite under judge Ingeborg James for 2 points towards her Canadian championship. 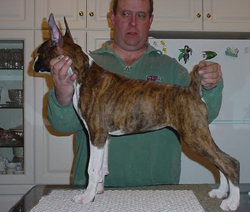 On 06 March 2005 at the Prince Albert Dog Show, Secret won best puppy in breed, best of winners, and best of opposite for another 2 points, this time under judge Thora Brown. 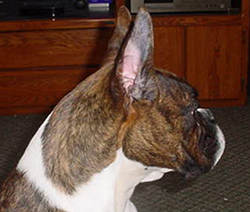 On 08 April 2005 at the Chautauqua Dog Show in North Battleford, Secret won best puppy in breed, best of winners, and best of opposite for 2 points under judge Letitia Betts. 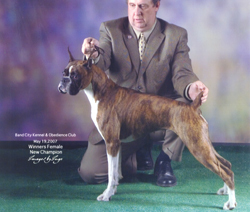 On 23 April 2005 at the Alberta Boxer Club Specialty in Edmonton, Alberta, Secret won first in the 9 to 12 class in the sweeps judged by Doug Smith, and then placed second in the 9 to 12 class in the specialty judged by Warren Hood. 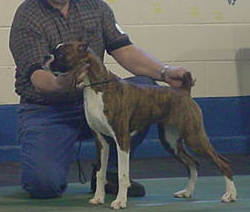 On 28 May 2005 at the Band City Dog Show in Moose Jaw, Secret won winner's female for 1 point under judge Neil Graves. 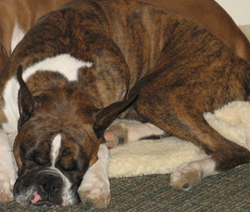 On 05 June 2005 at the Boxer Club of Canada National Specialty in Oshawa, Ontario, Secret placed fourth in the bred by exhibitor class under judge Cindy Meyers. 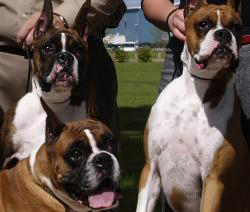 On 12 Aug 2006 at the Moose Jaw Canine Club Dog Show in Caron, Secret won winner's female, best of winners and best of opposite for 2 points under judge Barbara Watt. 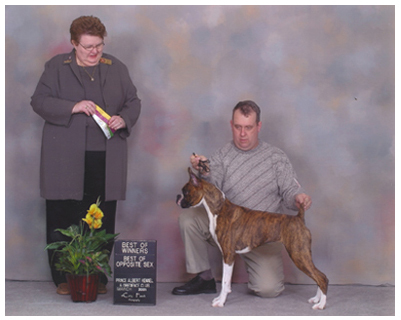 At the same show the day before (the 11th) and the day after (the 13th), Secret received winner's female and best of opposite under judges Rick Fehler and Wayne Thompson, respectively. This was Secret's first time back in the ring in over a year and she was shown by Doris Avery. Read about Doris in the Moose Jaw Times-Herald newspaper; she is pictured with Secret at the dog show in Caron. 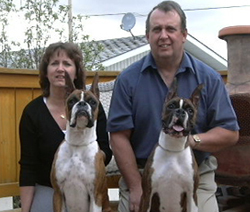 On 19 May 2007 at the Band City Dog Show in Moose Jaw, Secret won winner's female for 1 point under judge Don Emslie. She was shown by Dave and this completed her championship. 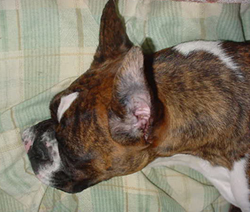 Secret at various stages in her life . . .
Secret dreaming as only babies can. Secret posing for her very first portrait. Secret chewing on a twig in the yard. Secret at 7 weeks of age. Secret not too happy with her new white hat. 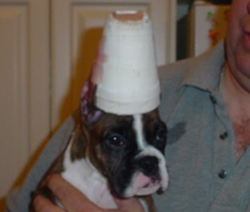 Dave stacking Secret at 3 months of age. Secret taking a short nap. Secret getting some beauty sleep. 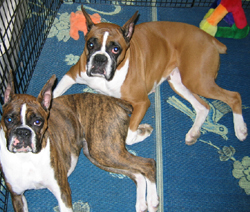 Secret and Sawyer sharing an x-pen at a dog show. Secret in a nice hard stack at her only fun match. Declan, Secret and Sawyer all ready for bed! Side profile of Secret's beautiful head. Secret playing with sisters, Chloe and Payton. Secret posing with Sawyer and Summer. Doris and Angus with Dave and Secret. Dave stacking Secret at her one and only fun match. Best of Opposite for Secret under judge Inge James. Championship (and WF) under judge Don Emslie. Secret snoozing on her new blanket. Secret playing with Sawyer and Declan.